This is the same car that has run 10.85 and 10.80 previously. It has "at least 100 LC launches on it according to the owner." 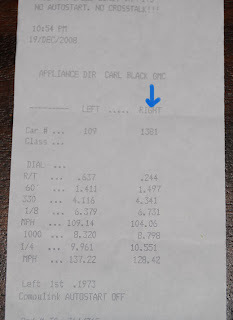 A 1.497 60 foot on 18" Mickey Thompson drag radials. We were running the same setup as our previous 10.80 run; just playing with some boost control settings. Mostly offset changes; still running 17psi. Car was running 100OCT. Temperature was about 71. LC was used. Congrats on the time. That is one sick GT-R.